Creating the perfect environment for your fish and plants in an aquarium is a difficult task. Each fish requires a different setting, water temperature, and lighting conditions. The same goes with natural plants if you want them to thrive. However, by following some simple rules of pairing and considering each plant’s characteristics, you can design a unique and loving home for all your plants, including lilies. Water lilies can be grown in a regular vase or fish bowl as long as you put the tuber and the roots in soil on the bottom of your tank. You can place them anywhere you desire in the bowl but, since they grow big, there won’t be too much room left for other decors or fish. The main reason why most people choose to plant their lilies in mud or soil is that it contains all the necessary fertilizers and nutrients to help the plant grow. However, you can also use a liquid fertilizer once a week, with similar results. So, if you decided to stick to lilies, here are some tips that will help you grow them in regular fish bowls. Certain fishes feed on plants and their leaves so putting them together in the same aquarium won’t be a smart move. 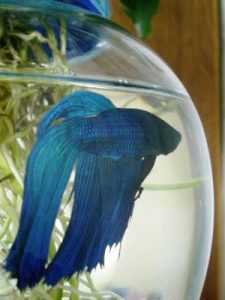 Although lilies are not pretentious plants, it would be best to pair them with betta fish, guppies, Koi fish or goldfish. These won’t feed off the flower and won’t be bothered in their habitat once the plant starts growing either. The second thing you need to take into account when growing a lily in a regular fish tank is to find the perfect shape and size of the vessel. If you choose a container that is too small, fish won’t have enough room to swim around, and they will feel crowded and uncomfortable. 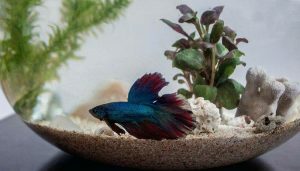 Keep in mind that betta fish require plenty of space to swim so make sure the water tank you think of has enough room for them, plants, and other colorful aquarium backgrounds and decors. Opt for containers with wide necks and bottoms that hold at least a quarter of the water. Therefore, you should avoid elongated vase shapes and rather stick to regular tanks or round bowls. As for the materials used, lead crystal can prove dangerous to your fish and plants, so pick another type of glass. And, if you don’t know which bowl shape, size, and material is best for your plant and fish pairing, look for online help or do some research on your own. Once you’ve picked the right bowl, it is time you moved to the central piece of your aquarium, the lily. Look for a lily that isn’t too large but comes with strong roots. Keep in mind that the roots will be completely submerged into the water, so they shouldn’t take more than 20% of the total size of the tank. This will give enough room for all your fish to swim. Also, consider lilies with a smaller diameter than the bowl’s opening to provide proper ventilation and enough air for both your plants and fish. Proper ventilation will also help keep the water fresh for a longer time, meaning you won’t have to change it every two days. Contrary to what you may think, you can’t just take the lily out of the soil and submerge it into the water. The first thing you need to do is take the plant from its pot and shake it gently to remove extra soil from the roots. Put it under running water and rinse the plant for a few minutes to remove all traces of soil and dirt before you place it in the fishbowl. To support the healthy growth of your lily, you will require a lid that fits the opening of the bowl. Choose a regular plastic tray and use a knife to cut an opening in the center of the tray. The hole should be wide enough to fit your lily’s roots. Bear in mind that betta fish must breathe oxygen from the surface in order to survive so don’t forget to make additional smaller holes all around the tray to ensure proper air circulation. Once the lily is secured in the fishbowl, you can proceed to decorate the rest of the tank. Start with a thick substrate of colorful pebbles and small rocks and leave the rest of the decor as simple as possible. Sometimes, less is more, especially when you have limited space. However, your betta fish will require some entertainment so consider filling the bowl with other natural decors such as coral skeletons, shells, wood logs, and stones. You can also pick some artificial decorations such as castles, houses, water wheels or treasure chests, as long as they don’t overcrowd the tank. You can opt for similar pebbles and colorful stones to decorate the lid and make it match the bottom of the fish tank. After you’re done decorating, fill the bowl with water. Don’t forget to leave enough space between the opening and the water level to provide enough air for your fish and plants to breathe. We suggest using filtered water to make sure it doesn’t come with impurities that might harm your live lily or pets. Dechlorinating drops also make a good addition. The water in the fishbowl should be changed at least once a week to ensure your plant grows healthy and strong. 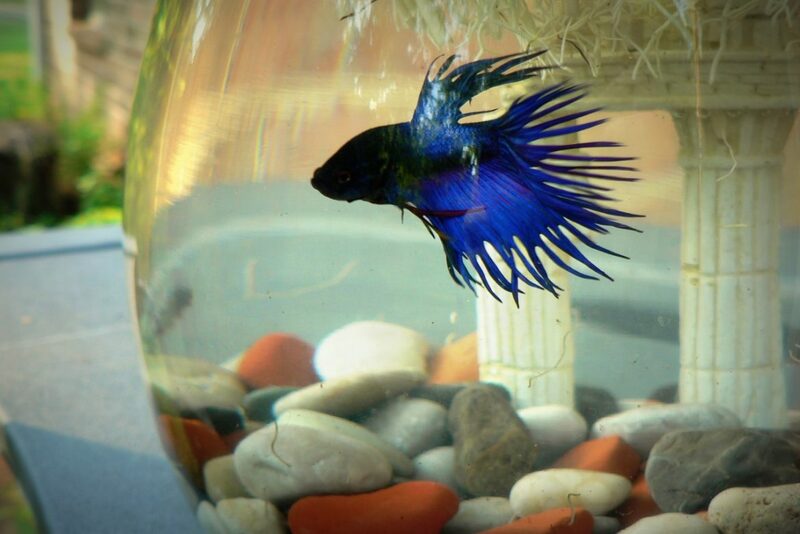 Betta fish should be fed twice a day while your plants will also require minerals. Leave enough room for your pets to swim around the roots of the lily.